52 Ancestors, No. 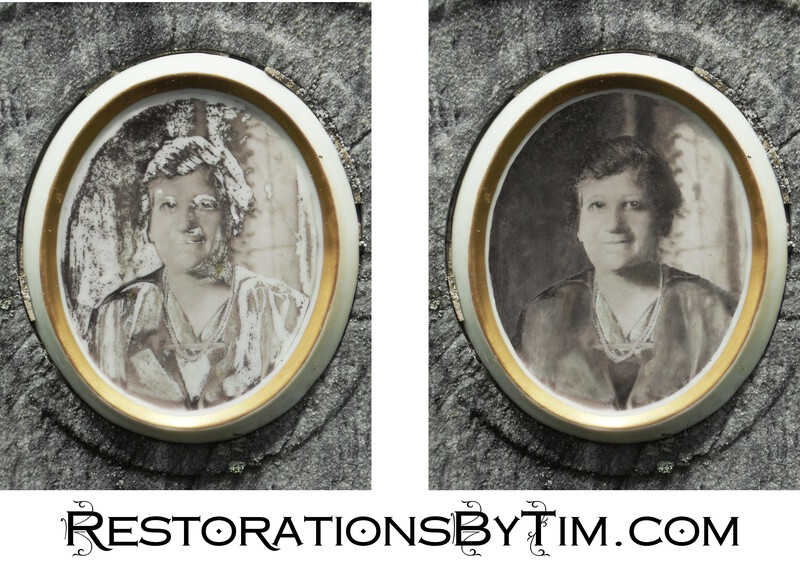 30: Anna Schachter, Gateway to An Extended Family | Photo Restorations by Tim G.
One of my best efforts so far, in my opinion, has been the restoration of Anna Schachter’s weathered porcelain gravestone photo. I fixed her up before I learned some of my newer tricks, but the work holds up, in my opinion. It was an amazing genealogical find as well, which potentially doubled the reach of my maternal grandfather’s extended family in America. My grandfather’s surname, Anflick, is uncommon. There are some Anflicks from England scattered about the Ohio area. I don’t know who there are, but if I see any Anflick’s anywhere else in America, I assume that they are related to me. I assume next that they are descended from the matriarch of the American Anflicks, my grandfather’s paternal grandmother, Katie Anflick. I did not know much about Katie’s early life, family, and arrival in America for quite some time, thanks to the Jewish proclivity towards many names, combined with her children’s apparent ignorance as to what any of those names were, other “Katie”. Add to that the apparent impossibility of correctly indexing the the name “Anflick”, and you’ll see the conundrum I’m in! Two of Katie’s children, Henry and Annie, knew enough to identify her maiden surname as “Karenchock”, or whatever, on their Social Security SS-5 applications. Henry’s older brother, Louis, allegedly stayed with an “uncle” named Joseph Singer upon his arrival in Philadelphia—but further investigation revealed Joseph’s wife’s maiden name to have been Rosa Hendrick. Their true relationship is still to me a mystery. Mastering the art of Ancestry.com’s wildcard searching has enabled several more recent breakthroughs. Among them was the passenger list from Katie’s arrival in America. She was indexed on the site as “Gittel Antlick“, and was with her children, “Mindel” and “Chane”. They arrived in Baltimore on the Steamship Neckar on September 13, 1903. Even more interestingly, they went to stay with an alleged brother-in-law by the name of Aron Schachter, who lived in Richmond, Virginia. This presented a second chance to discover additional relatives of Katie Anflick here in America: If I am reading the documents correctly, then either Mr. Aron Schachter is a brother of Katie’s husband, or, more likely, Mr. Schachter is married to a sister of Katie’s. Enter Mrs. Aaron Schachter, possibly a sister of Katie’s. She first revealed herself to me as “Hannah” in the 1900 census, and later as “Annie”. She and her husband came to America in 1888. Whether they were married before or after their immigration is unknown to me. As Americans, they first lived in Baltimore, where they had their first two children, Goldey and Sarah. They had their third child, Mary, after moving to Richmond. Of the children, only Sarah and Mary seem to have survived until 1910. By that time, the Anflicks who settled in Richmond had mostly moved to join Louis in Philadelphia. By 1922, the Schachters had all moved to Philadelphia as well. Anna died in Philadelphia in 1924. Her husband, Aaron, died twelve years later, in 1936. They are buried at Har Jehuda Cemetery in Upper Darby, not far from Katie. Their descendants include the Hornstine family of South Jersey. Louis Hornstine served as a New Jersey Superior Court Judge, and is now in private practice with the firm of Hornstine & Pelloni, which happens to have an office blocks away from my family’s summer home in Wildwood, N.J. Perhaps I might stop in to introduce myself. They might have the missing link that could identify precisely the relationship between Anna Schachter and my great-great-grandmother, Katie Anflick. That would open the gate to a whole new extended family! 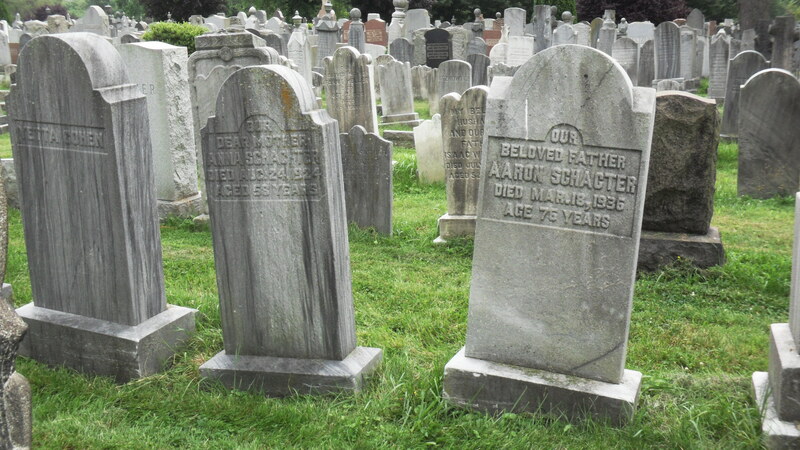 Aaron and Anna Schachter’s final resting places. 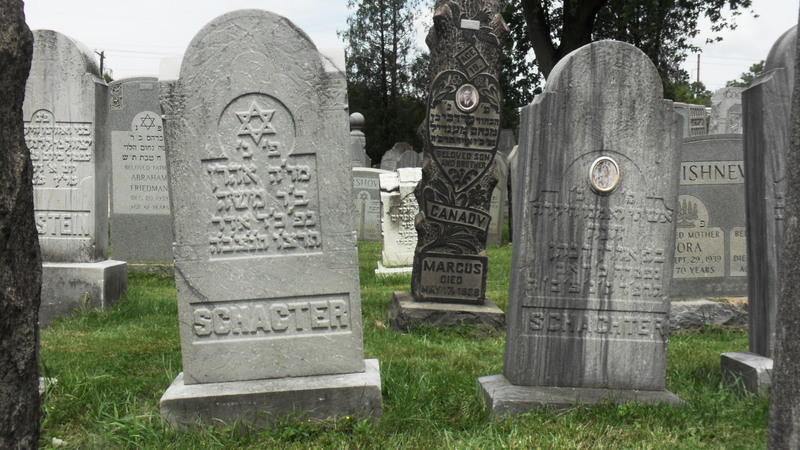 The reverse sides of the Schachter monuments. Anna at left, Aaron at right.